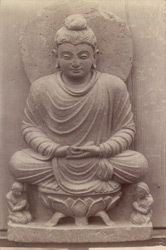 Photograph a statue of Budda sat on a lotus throne taken by Alexander .E Caddy in 1896. The ancient kingdoms of Udyana (Swat) and Gandhara (Peshawar), ruled by the Kushans from the first century AD, corresponded fairly closely with the northern part of the North West Frontier Province. The sculpture of the area, referred to as Gandharan, was influenced by Graeco-Roman elements and this influence can be seen in the draped clothing the figure wears, and in the naturalistic modelling of the body. In 1895 Surgeon-Major L.A.Waddell went to the Swat valley to undertake archaeological research and met with, Major Deane, the Chief Political Officer. Deane was a well-known archaeologist, who for many years has been zealously and most successfully exploring the Buddhist remains of Peshawar and its frontier countries. Concerning the meeting between the two, Waddell stated at the time that: "To him I explained the object of my mission, and pleaded the need in which the Indian Museum of Calcutta stood of specimens of Buddhist sculpture of the Gandhara type. Major Deane kindly promised his aid, and he generously said that he would make over to me all the numerous sculptures found in the Swat Valley, of which he had already got possession." The sculpture pictured here was one of those transferred.